Origin and Habitat: Bolivia, Department Chuquisaca, Province of Oropeza. Altitude range: 1900-2600 metres above sea level. Habitat: Weingartia longigibba grow on sandstone rocks near the Rio Chico. 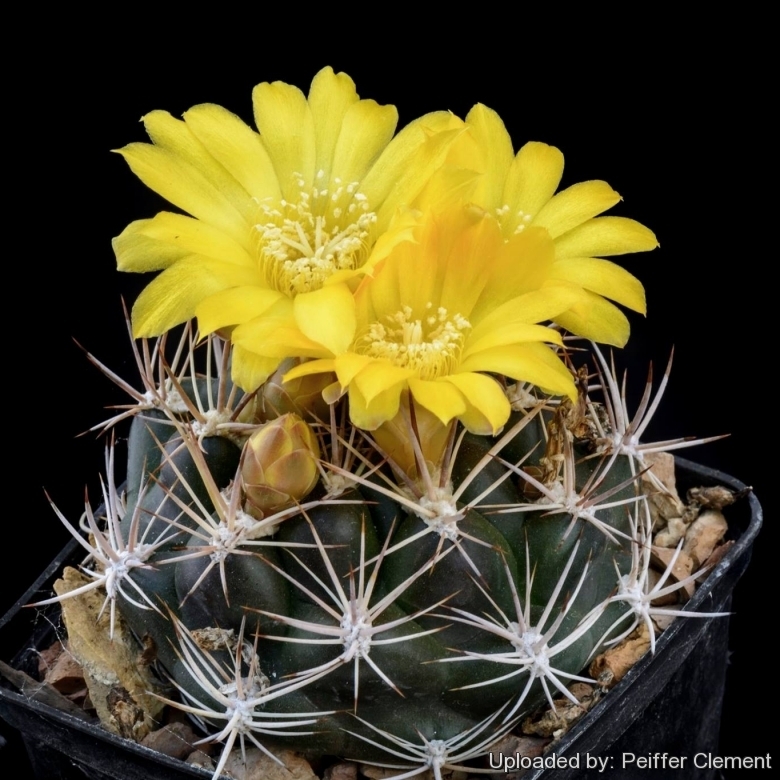 Description: Weingartia longigibba, is generally included within (as a synonym of) Rebutia neocumingii, suggesting that there is not really a fundamental difference between the two, and hard to name accurately without knowing where they come from. The bodies are more or less spherical 5 to 9 cm, or more in cultivation and clustering from around the base; the tubercles are large and prominant and very similar to those of Weingartia riograndensis. The areoles are woolly like those of Weingartia lanata and the flowers are 3 are about 3 cm long and wide, golden yellow, sometimes paler yellow. Derivation of specific name: The name longigibba, meaning "long humpy", refers to the large tubercles that helps distinguish this cactus from the other related taxon. Stem: At fist solitary often clustering from around the base with age, globose to short cylindrical , light green, with a spiny crown, not depressed, 5 to 9 cm, or more in cultivation, later becoming 2 or 3 times as tall as broad. Ribs: 16-18 tuberculate, often spiraling. Tubercles large and prominent 25-40 mm long, 15-25 mm wide, and 10 to over 15 mm high, steep, lacking a chin below the areole. Areoles: 8 to 12 mm long, 3 to 6 mm wide, with pale brownish wool, more developed in the younger, upper part of the stem, the areole groove continues downwards as a dividing furrow between the tubercles. Central spines: 3-8, longer and stronger than the radials (15-35 mm long) pale greyish brown, with slightly darker brown tips. Radial spines: 7-12, similarly coloured, 10-25 mm long, the upper the longer, straight or a little curved. Flowers: Approx 3 cm long and wide in diameter golden yellow, or paler yellow, the tepals often darker-tipped. The flowers are produced near the crown of the plant especially near the very tips of the stem or at the shoulder of the stem. Fruit: Longish, pale green, about 10 mm long and 6 mm wide.